Tata Motors launches its much-awaited SUV - Harrier UdaipurPlus :: pressnote.in promises to offer exemplary driving dynamics on varied terrains. The Harrier is the first vehicle to sport the IMPACT Design 2.0 design language of Tata Motors, which will appeal to customers with its stunning exteriors and luxurious interiors. Staying true to the Tata Motors DNA, the Harrier takes the in-car experience to the next level with segment-leading features. A Floating Island Touch screen Infotainment System with 8.8” High Resolution Display offers amazing in-car connectivity and infotainment though Android Auto & Apple Car Play*, the ConnectNext App Suite (DriveNext, Tata Smart Remote, Tata Smart Manual), Video &Image Playback, Voice Recognition & SMS Readout, Voice Alerts, and a lot more. A 320W RMS JBL Audio System with 9 speakers (4 Speakers + 4 Tweeters + 1 Subwoofer) creates an acoustically-tuned audio experience. Harrier features seamless mirroring of media, phone and navigation information between the infotainment and 7” Coloured TFT Display Instrument Cluster. 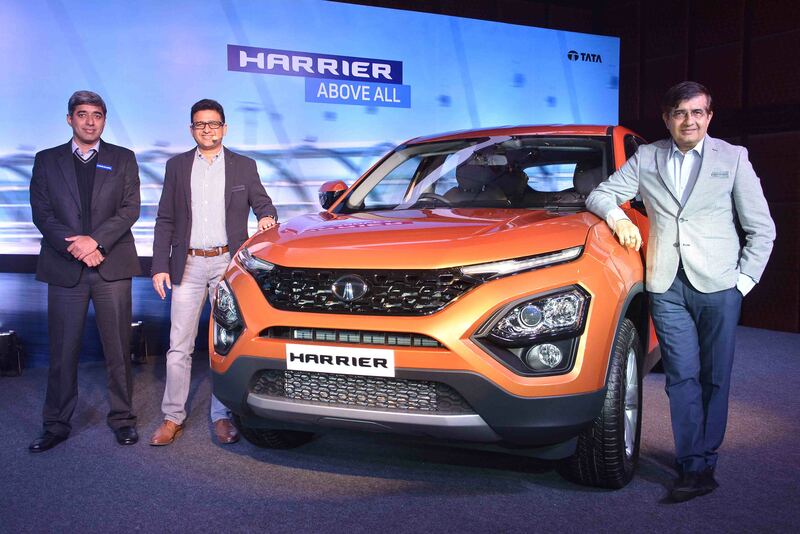 Udaipur : Tata Motors today launched its much-awaited SUV, the Harrier, which has impressed one and all ever since its concept H5X was first showcased at the Auto Expo2018. Harrier will be on sale across Tata Motors authorized sales outlets in Rajasthan at a starting price of Rs.12.69 Lakhs, starting today.